Battling repetitive strain injuries behind a computer screen all day, a busy commute home where you flit between work emails and your Facebook news feed, followed by a restless sleep and a six am alarm. Sound familiar? It’s no wonder so many of us are turning to Yoga for a bit of mental, spiritual and physical TLC. Yoga holidays are more popular than ever, with people venturing to the far corners of the world to perfect their practice and have a few days of recuperation. But, with luxurious locations, kitted-out yoga studios and a kitchen of organic, freegan, gluten-free superfoods, comes a hefty price tag that may leave you feeling a little less zen. Fear not! There is no need to head off to a five-star boutique hotel or spend hundreds on a long haul flight to experience a great yoga retreat (although if you can, we definitely recommend it!). Check out these affordable yoga holidays where you can downward-dog, chant and meditate ’til your heart’s content – with the only strain being from increasing your stretch (rather than your purse strings). Namaste folks! Less than half an hour from the lively Costa del Sol, La Renaja‘s idyllic mountain setting in the Sierra Almijara is about as picture-postcard as you can get. 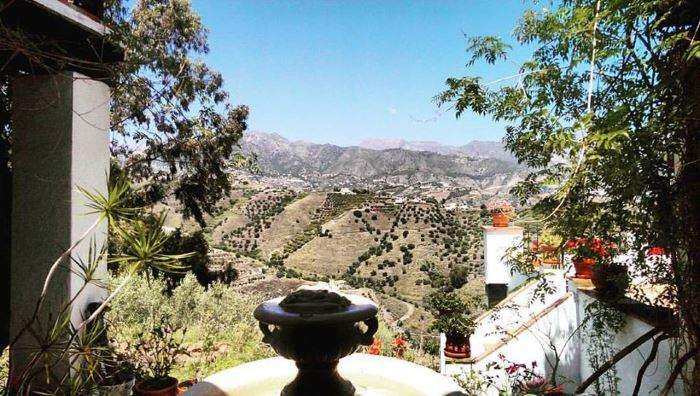 From its courtyards, patios and bedrooms there are impressive views across the valley to the nearby whitewashed village of Frigiliana and down to the coast. The retreat offers two sessions of yoga a day – one in the morning and a restorative class in the evening – and three delicious vegetarian meals a day, made using plenty of local, organic and often homegrown produce. When the word ‘bohemian’ is uttered, it is fair to say that yoga springs to mind. It’s no wonder that hostels and yoga make for a great pairing. This is most notable at Jam Hostel, in Barcelona‘s trendy Gracia neighbourhood. They offer morning yoga classes (for only €5) and comfortable, budget accommodation. You may be in city, but a few yoga sessions combined with Barcelona’s laid-back, beach-bum attitude, is more than enough to leave you feeling totally chilled out. The small town of Taghazout in Morocco has embraced the laidback beach lifestyle well and truly. 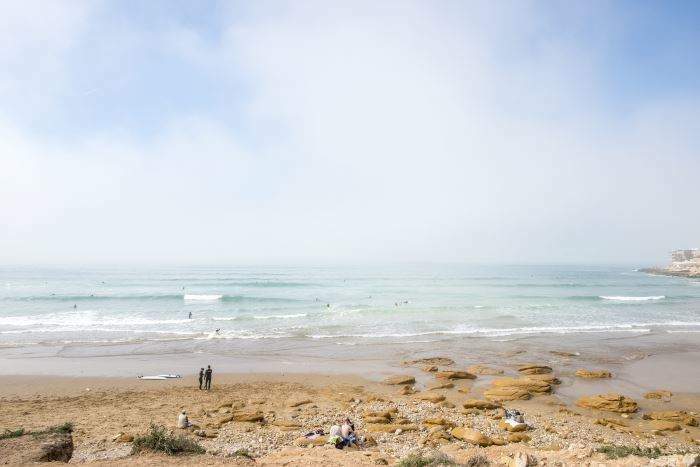 This sleepy town is where Surf Berbere‘s owners set up camp and now provide budget friendly surf camps to those looking for year round sunshine, great waves and a chilled out atmosphere. 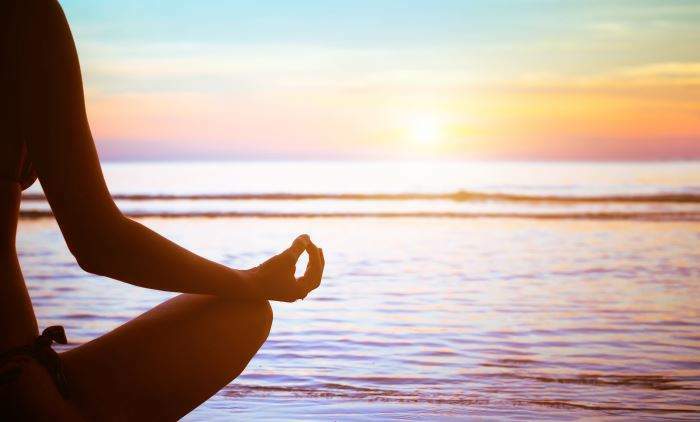 It’s extremely calm vibe lends itself well for a spot of seaside meditation and now the surf school offers surf and yoga holidays, that combine daytime surf classes and sunset yoga. Another city hostel, Woodah Hostel in Copenhagen, whose focus is on being not only great hosts, but as their website states, on being a “tranquil spot in an otherwise busy urban landscape”. Along with the minimal decor and all the quirky furnishings you’d expect of a trendy hostel located in one of Copenhagen’s wonderfully gentrified areas, you’ll be offered free morning yoga classes, followed by a vegetarian breakfast. Festivals, fun as they are, usually equate to four or five days of overindulgence and sleepless nights. Not Obonjan. The festival, that launched in July 2016, is an event like no other. Located in the previously abandoned island of the same name, the people behind Croatia‘s famous Hideout festival have created an oasis, where people can enjoy the music and atmosphere of a music festival, with the serenity of a wellness holiday. Along with big name musicians, there will be a programme of yoga and other wellbeing events. Greenery and pristine beaches make this place a dreamy detox spot. The dramatic landscape surrounding YogaOnCrete‘s traditionally Cretan home, make it an impressive location for a spot of downward dog. It’s located in the village of Chora Sfakion, on Crete‘s southern coast – a pleasingly quaint location with shops and restaurants nearby. The slow-paced island way of living rules here, and the house’s gardens and grounds offer some welcome isolation for meditation. Reasonably priced retreats throughout the year can be booked, with different styles of yoga on offer. The retreat also offers woman’s only weeks and yoga breaks with dance classes too!